Leading on from kunuma's post and our discussion about Arabs, just out of curiosity wondering how many people love em and how many are left cold by them. And some of these are my relations Haffy, so you mustn't be too rude!! Oh those horse, there lovely kunuma, you lucky thing being related to sum off them. I'll have the fifth one down please. Plus when you do get them going nicely they look fantastic. Immaculate taste Rosie - that's 'my relative' - well I am stretching it a bit really, more of an 'in law' really!! Not so much unstable as incredibly sensitive and very good at 'reading' people, and heaven help you if they don't like what they read!! They are pretty hyperactive though, and hence can go wrong very quickly when misunderstood. 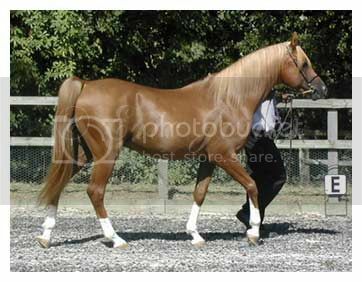 I'm thinking there must be a gorgeous Haflinger cross Arab out there somewhere that might influence our haffy? Lovely, lovely. 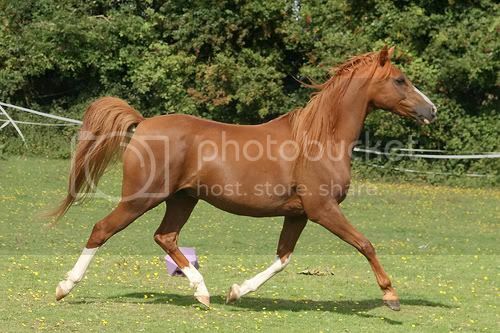 My Arab boy's the most gorgeous horse I know, and I agree thery're so sensitive and intelligent. I also find x=breds lovely, long as you get the action. Kunuma, what bloodlines are this lot? And that chestnut is so on my birthday list! 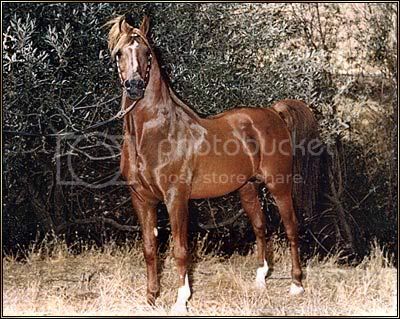 Kunuma is chestnut the predominant colour with Arabs? Most of those I see seem to be chestnuts. I do have a weakness for the greys tho. Crikey Claire -don't get me started on colour genetics, I'll give you a week long lecture!! Basically though, grey is a dominant colour - so can mask other recessive colours, hence unless a grey is homozygous (only grey genes) when it will only throw greys, two greys could produce any colour. 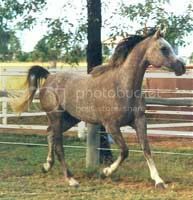 However, say a grey carries the very recessive chestnut (so recessive that two chestnuts will have a chestnut foal, hence it is easy to keep breeding chestnuts) our grey if mated to another grey also carrying chestnut, can produce greys or chestnuts, but the chestnuts could not produce a grey. With the old English Crabbet lines, many of them were grey carrying chestnut - hence all the chestnuts and greys in the old lines and still around today of course! You can tell what the recessive colour is by looking at the colour of the foal when born. 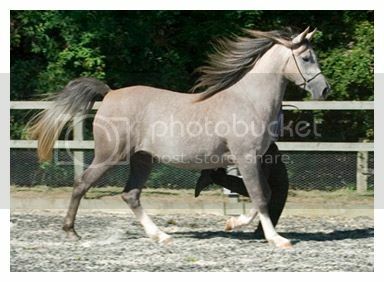 My grey boys carried chestnut and were born chestnut foals, going through that lovely rose grey stage (not roan!!) Plus the speckles on a fleabitten grey will be of the colour it is carrying! Oh dear this was meant to be a quick answer! 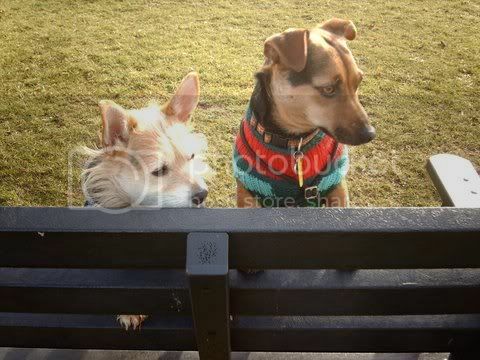 I only came on to post this piccy for Haffy - then I have to dash to the PO in my walker to collect my pension! I like them (but not the ones that seem exaggerated in all their features with almost unnaturally dished faces). 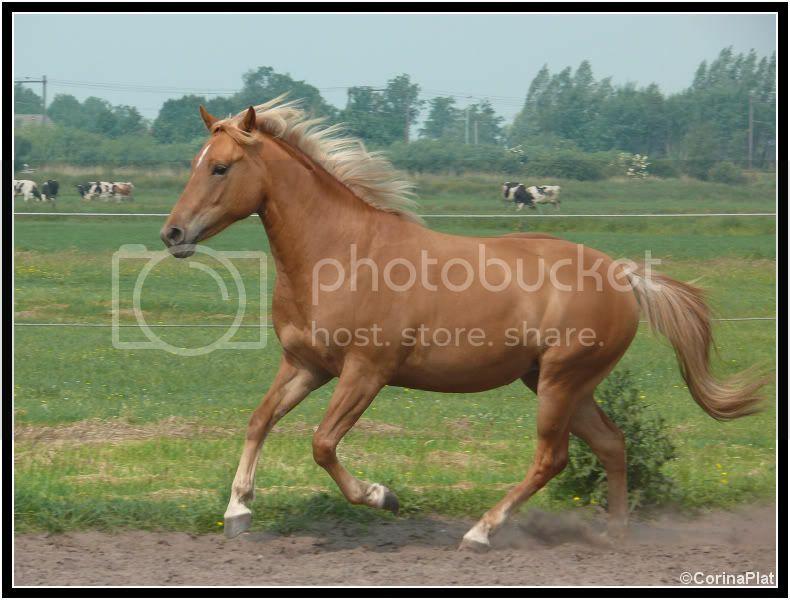 We used to have a beautiful Palomino stallion where I rode and I think he was 3/4 arab. He was fun to ride! Yes, part breds rock! 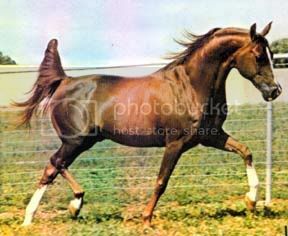 The last stally in those pics (and um, I don't label my photo collection from the web, I think I had better start if I'm going to post them on forums ) was Serafix, an English bred from years ago, who was imported to America. A stud there seem to have started a Morab line with his genes, how's this ( see second pic below) for a nice little part bred - good tracking up! Forgot to say that the one for haffy was indeed a haffy cross Arab, and cos' I know she likes QH here's a Quarab for her! Whats a Morab? Is it a cross? Too araby looking for me if it's the first piccy but the Quarab and haffy cross (if it's the 2nd pic?) are much more my cup of tea...like Sarah siad it's the exaggerated features and the 'just stuck their hoof in the mains' pop eyed look/stance they have I dislike. Infact i'm liking the one in the second pic very much indeed! I'm not sure how to vote - I love the way they look, they are beautiful but their temperament bothers me. I know I shouldn't assume they're all nutters (my welsh d was off his head and they're supposed to be sensible) but have to admit when I've been looking for a horse I tend to write off the arabs. I m the same, I love them but Im not shore if a Arab and I wood get a long, but I cant help but admire them there so perfect. Was it Sue? Me too, i'd much prefer to have had him than Shantih, any day of the week. And Bramble too. I like them, particularly the grey ones, but I'd probably prefer a Connemara pony or a Highland pony given the choice. I'm an Arab lover . Just the sight of them makes me feel all fuzzy,temperament wise (and i know they are not all mad) i don't know that i could own one again,the older i get the more appealing old plodders become. 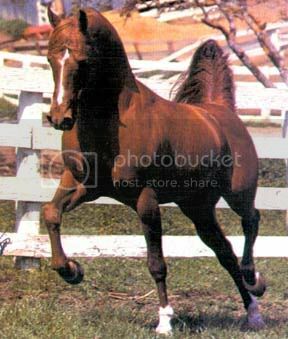 When i think about some of the wild,spooky horses i used to ride in my younger days,in just a halter along busy roads, i can't believe i used to be so fearless and stupid . the older i get the more appealing old plodders become. I can relate to this. I think self preservation kicks in when you get older. Someone let me ride their horse a while a go and it spooked at every little thing, reared when it decided it had had enough and wanted to go home, wasn't too happy seeing large lorries. I came back a nervous wreck! The thought of a nice slow riding school plod suddenly became very appealing! A morab is a Morgan ArabianX isn't it? 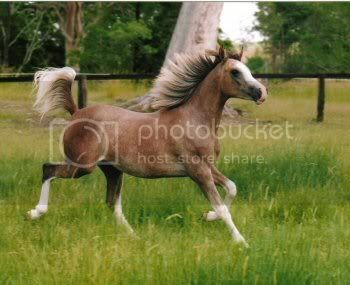 I love Arabians generally though they do tend to be 'one person horses' ie. they bond strongly with their human so they can come across as aloof. They are extremely beautiful but I hate the 'done up for show' look with that overdone eye make up, and that stupid pose they have to do. 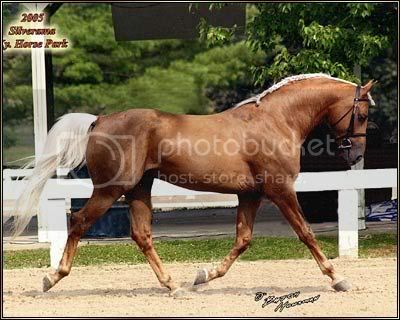 Personally, I think Arabs look best under saddle and doing something. The nearest my boy's ever got to a show ring is the local show jumping, and by the time he comes out the indoor school, his socks have turned yellow. Not really so beautiful then ! My Arab mare Shantih is mental!! Taken yesterday! 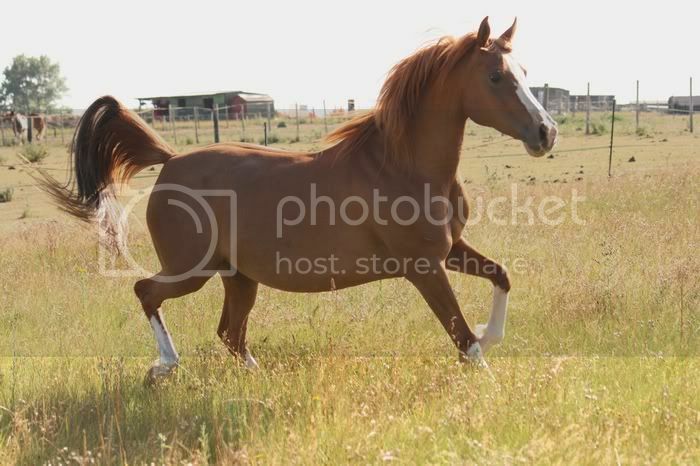 Lovely Mare.. Whats her breeding.? Sorry its an addiction for me to know that..
Is she related to the horse on the front of the new Jinny books?? 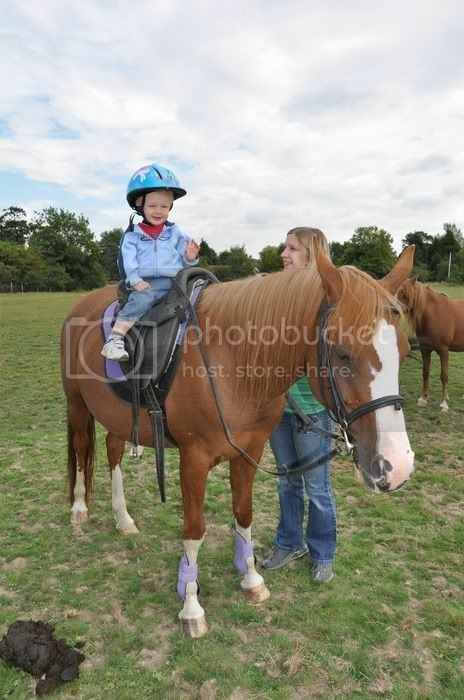 Just got sent piccies of them and the new Jill one by Amazon, and the mare is so similar. Her registered name is Zeitia.